Quarterback Andrew Hatch returns to the Harvard fold. Quarterback Andrew Hatch’s forte is passing, but Brown’s defenders kept him on the run in a 29-14 blowout. It was the best of times, it was the worst of times. With new quarterback Andrew Hatch ably managing the offense, the football team looked invincible in its opening game, a 34-6 rout of Holy Cross. Harvard then lost to Brown, 29-14, and played so ineptly that the prospect of a championship season seemed fanciful. Harvard won the Ivy League title outright in 2007, shared it with Brown in 2008, and was favored to win it a year ago. But the 2009 team lost to Penn and finished second to the Quakers. This year, for the fourth time in the past five seasons, a preseason media poll had the Crimson finishing first, ahead of Penn, Brown, and Yale. Head coach Tim Murphy said the ranking was undeserved, and his team’s poor showing in the Brown game--a farrago of turnovers, botched plays, and costly penalties--suggested that the coach was not being coy. Murphy was fortunate to have Hatch, of Henderson, Nevada, and Leverett House, as his quarterback pro tem. A transfer from Louisiana State University, he’d been expected to back up Collier Winters ’12, a hard worker who had made second team all-Ivy in his first season as a starter. But Winters tore hip and groin muscles in a preseason scrimmage, and Hatch got the starting assignment. In his varsity debut he directed the Crimson offense with aplomb, completing 20 of 25 passes against Holy Cross. Early in the second quarter he threw the first of three touchdown passes, a 26-yarder to receiver Marco Iannuzzi ’11. 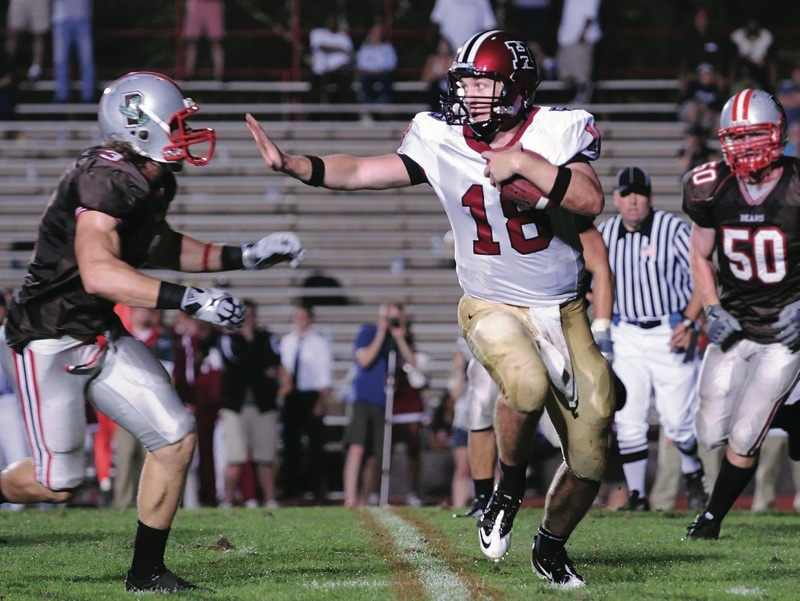 Chris Lorditch ’11, the team’s top receiver, caught second-half touchdown passes of eight and 43 yards, giving Harvard a 34-0 lead midway through the final period. The Crimson defense kept the visiting Crusaders off the scoreboard until the game’s final minute. Hatch threw the ball with precision, connecting on 12 of 14 first-half passes. When he had to scramble, he showed speed and mobility for a man of his size (he stands six-four and weighs 225). A week later the team journeyed to Providence for the first night game ever played at Brown Stadium. Brown’s swarming defenders put relentless pressure on Hatch and stopped the Crimson rushing attack in its tracks. Hatch took a stinging helmet-to-helmet shot on Harvard’s first offensive play, and was later found to have received a concussion. He continued to play and was lucid on the sideline, completing 11 of 23 passes for 128 yards but throwing two interceptions that led to Brown scores. The Bruin offense dictated the course of the game from the outset, keeping Harvard’s defense on the field for 39 minutes of play. A moment of uplift came late in the first half, after a Brown scoring drive had staked the Bears to a 23-0 lead. A squibbed kickoff gave Harvard the ball at midfield with just 29 seconds to play, and Hatch needed only three throws to move his team 45 yards, rifling a 21-yard scoring pass to Iannuzzi in the Brown end zone. Iannuzzi then caught the second-half kickoff and returned it 95 yards for a second Harvard touchdown. In a span of 36 seconds, Harvard had cut Brown’s lead to 23-14 and was seemingly back in contention. But Hatch threw his second interception of the game on the Crimson’s next series, and Brown capitalized with a 44-yard field goal by freshman Alex Norocea. Another offensive misplay led to Brown’s final score, after an errant center snap sailed over the head of punter Jacob Dombrowski ’13. The Bears retrieved the ball at Harvard’s 22-yard line and Norocea kicked his fifth field goal of the game, tying a Brown record. Hatch’s concussion kept him out of the season’s next game, a 35-10 win at Lafayette. How soon he would be cleared to compete again remained uncertain. But because Hatch took the scenic route back to Soldiers Field, he now has scant time to make his mark in Harvard football. Recruited by Brigham Young University as a high-school senior, he had second thoughts when coach Gary Crowton left BYU, and enrolled at Harvard instead. As a freshman Hatch was the junior varsity quarterback in 2005, running for one touchdown and passing for another in the JV finale at Yale. He then took a leave of absence to go on a Mormon mission to Chile. There he injured his knee in a soccer game, and returned to Nevada for surgery. Transferring to LSU, where Crowton was coaching the offense, Hatch started the first three games of the Tigers’ 2008 season, but was sidelined by a concussion and later by a leg injury. Resolved to wind up his college football career where it began, he reapplied to Harvard and enrolled at the start of 2009. The NCAA’s transfer rules required him to wait a full season before suiting up, so he spent last fall as quarterback of the varsity’s scout team. A psychology concentrator, Hatch is classed by the College as a second-semester junior. But because his eligibility expires this year, his athletic status is that of a senior. With Collier Winters expected to remain on the disabled list, Harvard football fans must hope to catch more than a fleeting glimpse of Hatch in action before time runs out. Tidbits: Winters tore adductor and labrum muscles on his right side, mirroring a left-side injury that kept him out of action in 2008. He won the starting assignment a year ago, led the Ivy League in passing efficiency, and sparked Harvard’s late-game comeback in a 14-10 victory over Yale (see “Stinging the Blues,” January-February 2010, page 56). Winters could return next year with two seasons of eligibility. After hours: The last four home openers have been played at night, drawing an average of 19,380 spectators. Harvard is 4-0 under Stadium lights. The loss at Brown was the Crimson’s first night road game; the stated attendance was 17,360.…Harvard has won its Ivy opener in 10 of the past 12 seasons, but has lost in its last two visits to Brown Stadium. Abysmal: The Harvard offense recorded minus-16 yards rushing against Brown. That statistic reflected a fumbled punt snap and two quarterback sacks, costing a total of 44 yards. Three Crimson running backs were held to a collective net gain of 12 yards on eight carries; all-Ivy back Gino Gordon ’11 netted minus-one yard on five carries.…Tackle Brent Osborne ’11 is the only returning starter on the offensive line. The effects of front-line attrition were all too evident in the Brown game. Harvard yardage: The ground game revived in the team’s 35-10 victory over winless Lafayette. The offense rolled up 311 yards rushing, with Gordon gaining 170 yards and scoring two touchdowns. His second came on a 74-yard broken-field run, the longest gain of his Harvard career. With sophomore quarterback Colton Chapple subbing for Hatch, the offense had a fumble-free, interception-free day. Reshuffle: Crimson teams have faced the same slate of opponents for six seasons, but that will change in 2011–2012. Bucknell replaces Lehigh as a Patriot League adversary next year, and in 2012 the University of San Diego comes to the Stadium for the season’s opening game. A road opener at San Diego is set for 2013. Harvard hasn’t played football in the West since its calamitous 44-0 loss to Stanford in 1949.…San Diego’s only previous Ivy foe has been Yale. The Toreros and Elis met four times from 1999 to 2006, splitting the series, 2-2.